"Knicks" redirects here. For other uses, see Knick. 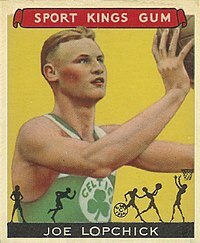 The team, established by Ned Irish in 1946, was one of the founding members of the Basketball Association of America (BAA), which became the NBA after merging with the rival National Basketball League (NBL) in 1949. The Knicks were successful during their early years and were constant playoff contenders under the franchise's first head coach Joe Lapchick. Beginning in 1950, the Knicks made three consecutive appearances in the NBA Finals, all of which were losing efforts. Lapchick resigned in 1956 and the team subsequently began to falter. It was not until the late 1960s when Red Holzman became head coach that the Knicks began to regain their former dominance. Holzman successfully guided the Knicks to two NBA championships, in 1970 and 1973. The Knicks of the 1980s had mixed success that included six playoff appearances; however, they failed to participate in the NBA Finals. The playoff-level Knicks of the 1990s were led by future Hall of Fame center Patrick Ewing; this era was marked by passionate rivalries with the Chicago Bulls, Indiana Pacers, and Miami Heat. During this time, they were known for playing tough defense under head coaches Pat Riley and Jeff Van Gundy, making two appearances in the NBA Finals, in 1994 and 1999. However, they were unable to win an NBA championship during this era. Since 2000, the Knicks have struggled to regain their former glory, but won its first division title in 19 years in 2012–13, led by a core of forwards Carmelo Anthony and Amar'e Stoudemire. They were eventually eliminated in the Eastern Conference semi-finals by the Indiana Pacers, and have failed to make the playoffs since. Irish wanted a distinct name for his franchise that was representative of the city of New York. He called together members of his staff for a meeting to cast their votes in a hat. After tallying the votes, the franchise was named the Knickerbockers. The "Knickerbocker" name comes from the pseudonym used by Washington Irving in his book A History of New York, a name that became applied to the descendants of the original Dutch settlers of what later became New York, and later, by extension, to New Yorkers in general. In search of a head coach, Irish approached successful St. John's University coach Joe Lapchick in May 1946. Lapchick readily accepted after Irish promised to make him the highest paid coach in the league; however, he requested he remain at St. John's one more season in hopes of winning one last championship. Irish obliged, hiring former Manhattan College coach Neil Cohalan as interim coach for the first year. In the 1974–75 season, the Knicks posted a 40–42 record, their first losing record in eight seasons. The team still qualified for a playoff spot, however, but the opportunity was squandered as they lost to the Houston Rockets in the first round. After two more seasons with losing records, Holzman was replaced by Willis Reed, who signed a three-year contract. In Reed's first year, New York finished the year with a 43–39 record and returned to the Eastern Conference semi-finals, where they were swept by the Philadelphia 76ers. The next season, after the team began with a 6–8 record, Holzman was rehired as the team's coach after Reed had angered Madison Square Garden president Sonny Werblin. The team did not fare any better under Holzman's direction, finishing with a 31–51 record, their worst in thirteen years. Hubie Brown replaced Holzman as head coach and in his first season, the team went 44–38 and made it to the second round of the playoffs, where they were swept by the eventual champion Philadelphia 76ers. The next season, the team, aided by new acquisition Bernard King, improved to 47–35 and returned to the playoffs. The team defeated the Detroit Pistons in the first round with an overtime win in the fifth and deciding game, before losing in second round in seven games to the Celtics. The team's struggles continued into the 1984–85 season, as they lost their last twelve games to finish with a 24–58 record. The first of these losses occurred on March 23, 1985, where King injured his knee and spent the next 24 months in rehabilitation. Hoping to find a leader that could put the team back on track, New York hired Larry Brown to coach the team. Brown, who idolized the team during his childhood, was well regarded for his coaching abilities and his arrival brought a sense of hope to the franchise. Hoping to find the next Patrick Ewing, the Knicks drafted center Channing Frye and signed centers Jerome James and Eddy Curry, the former prior to the season and the latter during the season. Curry, who reportedly had a worrying heart condition, refused to take a controversial DNA test, and fell out of favor with John Paxson, Chicago's general manager. The Bulls signed-and-traded him to the Knicks along with Antonio Davis for Tim Thomas, Michael Sweetney, the Knicks' 2006 first-round pick, and the right to swap first-round picks with the Knicks in 2007, as well as 2007 and 2009 second-round picks. Isiah Thomas did not lottery-protect the picks, and the Knicks forfeited the second pick in the 2006 draft, and the ninth in the 2007 draft. With a bloated payroll, the Knicks stumbled to the second worst record in the NBA that season, at 23–59. The season concluded with the firing and $18.5 million buy-out of head coach Larry Brown after one season. During the 2007 off-season, the organization became embroiled in further controversy away from the basketball court. Anucha Browne Sanders, a former Knicks executive, had filed a sexual harassment lawsuit against Isiah Thomas and Madison Square Garden. Faced with a trial, the jury returned a verdict finding Thomas and Madison Square Garden liable for sexual harassment. The jury also levied $11.6 million in punitive damages against Madison Square Garden, though this was later reduced to $11.5 million in a settlement between both parties. The ordeal proved embarrassing for the franchise, revealing sordid details about Knicks management and the environment at Madison Square Garden. The Knicks struggled as they opened their 2007 campaign with a 2–9 record leaving many Knicks fans, frustrated with the franchise's lack of progress under Thomas, called for the coach's firing—the chant "Fire Isiah" became a common occurrence during the Knicks' home games. On November 29, 2007, the Knicks were handed one of their worst defeats in their history by the Boston Celtics, with a final score of 104–59. This matched their third-largest margin of defeat. New York went on to post an eighth consecutive losing season and tied the franchise mark for their worst record ever, at 23–59. On November 21, 2008, the Knicks dealt one of their top scorers, Jamal Crawford, to the Golden State Warriors for Al Harrington. Hours later, New York traded Zach Randolph, along with Mardy Collins, to the Los Angeles Clippers for Cuttino Mobley and Tim Thomas, with the intention of freeing cap space for the 2010 off-season, when top-flight players such as LeBron James, Dwyane Wade, Chris Bosh, and Amar'e Stoudemire would be available. In February 2009, the Knicks traded Tim Thomas, Jerome James, and Anthony Roberson to the Chicago Bulls for Larry Hughes, in addition to sending Malik Rose to the Oklahoma City Thunder for Chris Wilcox. In the 2009 NBA draft, the Knicks selected forward Jordan Hill eighth after targets such as Stephen Curry, Jonny Flynn, and Ricky Rubio were off the board. Guard Toney Douglas was then selected with a 29th overall pick, which was acquired from the Los Angeles Lakers. Shortly afterwards, New York executed a trade with the Memphis Grizzlies in which the Knicks acquired Darko Miličić in exchange for Quentin Richardson. The Knicks got off to their worst ten-game start in franchise history, producing nine losses, with just one win. The Knicks responded by winning nine games and losing six in December. On January 24, 2010, the Knicks suffered their worst home loss in Madison Square Garden history against the Dallas Mavericks in front of a sellout crowd. The 50-point loss was also the second-worst in Knicks franchise history. Under Woodson, the Knicks finished 18–6 during the regular season and clinched a playoff spot for the second straight year this time as the seventh seed, making it the first time they have clinched consecutive playoff berths since making 13 straight playoff appearances from 1988 to 2001. Not only did they also clinch consecutive winning seasons for the first time in a decade, but their 36–30 record was the highest winning percentage for the team since the 2000–01 season. The Knicks faced the Miami Heat in the first round of the playoffs and lost the first three games, breaking the NBA record for longest playoff losing streak at 13 games. The team's struggles were partially attributed to injuries as Jeremy Lin, Baron Davis and Iman Shumpert were all sidelined by knee ailments. The Knicks proceeded to win a close Game 4, which snapped their streak and ensured that they would not be swept out of the first round however, they failed to keep up with the Heat's up-tempo offense in Game 5 and lost the series 4–1. Despite the team's disappointing postseason exit, the Knicks removed Woodson's interim status and he was officially named the full-time head coach on May 25, 2012. The Knicks began their off-season by selecting Greek forward Kostas Papanikolaou in the 2012 NBA draft. One week later, the team came to terms with veteran point guard Jason Kidd, who was originally supposed to serve as a backup to Lin. The Knicks also re-acquired Marcus Camby from the Houston Rockets in a sign and trade sending Houston Josh Harrellson, Jerome Jordan, Toney Douglas and 2014 and 2015 two second-round picks and completed a sign-and-trade with the Portland Trail Blazers that brought back Raymond Felton and Kurt Thomas in exchange for Jared Jeffries, Dan Gadzuric, and the draft rights to Papanikolaou and Greek forward Georgios Printezis, whose draft rights had been acquired by the Knicks in December 2011. The Knicks also re-signed free agents J. R. Smith and Steve Novak and added more players to the roster, such as James White, Chris Copeland, and Argentinian point guard Pablo Prigioni. However the Knicks lost restricted free agents shooting guard, Landry Fields to the Toronto Raptors and point guard, Jeremy Lin to the Houston Rockets, who were both key players during the 2011–12 season. The Knicks decided not to match those teams' offers. Despite these losses, the Knicks continued to add players to the roster, signing former Chicago Bulls guard Ronnie Brewer on July 25, 2012 and signing Chris Smith, the younger brother of J. R. Smith, on August 1, 2012. It was also announced that Rasheed Wallace would come out of retirement to play for the Knicks on October 2, 2012. Despite playing without an injured Iman Shumpert and Amar'e Stoudemire, the Knicks compiled an 18–5 record to start the season, their best start since 1993. In their first four games, they scored at least 100 points and won by double digits in all of those games. The streak ended after a 10-point loss to Memphis Grizzlies. The following Sunday, in a game against the Indiana Pacers, the Knicks at home went on to win 88–76, assuring them a 7–1 record. After two tough losses to the Dallas Mavericks and Houston Rockets, the Knicks returned home in a game against the Detroit Pistons on November 25, with a 121–100 blowout win, making them one of only three teams undefeated at home along with the Miami Heat and Utah Jazz. The Knicks finished November with an 11–4 record, their best month record since going 11–6 in March 2000. By the All-Star break in mid-February 2013, the Knicks compiled a 32–18 record, good for second in the Eastern Conference. On February 21, on the trade deadline, the team traded Ronnie Brewer for a 2014 second-round draft pick. The Knicks then signed veteran power forward Kenyon Martin to a 10-day contract. In late March, the Knicks went on to compile a four-game losing streak, tying their worst skid of the season. They would go on and face the Jazz on the road, eventually winning the game and starting what would turn out to be a 13-game winning streak, including wins against the Miami Heat and the Oklahoma City Thunder. This was the third-longest winning streak in franchise history. On April 9, the Knicks beat the Washington Wizards to secure the Atlantic Division title for the first time since the 1993–94 NBA season. The Knicks' 13-game winning streak came to an end on April 11 as they lost to the Chicago Bulls. Despite that, they set the NBA single season record for three-pointers. On May 3, the Knicks defeated the Boston Celtics in the first round of the NBA playoffs, 4–2, their first playoff victory since 2000. On May 18, the Knicks were eliminated in the second round of the playoffs, losing the series to the Indiana Pacers 4–2. Point guard Jason Kidd retired following the end of the season—he was named head coach of the Brooklyn Nets a few days later. In the 2013 NBA draft, the Knicks selected Tim Hardaway Jr. as the 24th pick in the first-round. During the 2013 off-season, The Knicks claimed Los Angeles Lakers F Metta World Peace off of waivers. They re-signed J. R. Smith to a 3-year, $18 million deal and traded Quentin Richardson, Steve Novak, Marcus Camby, and three draft picks to acquire Andrea Bargnani from the Toronto Raptors. The Knicks also saw changes to business operations in late 2013, replacing general manager Glen Grunwald with former MSG president Steve Mills. The Knicks also purchased an NBA D-League team located White Plains, which began operations at the start of the 2014–15 NBDL season. The Knicks then appointed former coach Phil Jackson as president of basketball operations, with Mills remaining as general manager, with the duo working directly under MSG chairman James Dolan. Following the 2013–14 season, coach Mike Woodson and his entire staff were fired, and was replaced by Derek Fisher. Fisher played under Jackson with the Los Angeles Lakers, winning five NBA championships with the franchise. The Knicks finished the season with a disappointing 37–45 record and finished ninth in the Eastern Conference, but was the season Carmelo Anthony established his career high, the Knicks' franchise record, and the Madison Square Garden record for single-game scoring. Anthony recorded 62 points and 13 rebounds in a victory against the Charlotte Bobcats. The Knicks observed their worst ever regular season record under the stewardship of Phil Jackson, who acted as the president of the franchise from 2013 to 2017. Forbes magazine released its franchise value rankings for NBA teams, and listed the Knicks as the world's most valuable basketball organization at $1.4 billion in 2014, edging out the Los Angeles Lakers by $50 million. The Knicks were valued at 40% more than the third-place Chicago Bulls valuation of $1 billion, and were valued nearly twice as highly as their crosstown rivals, the Brooklyn Nets, who came in at $780 million. In the off-season, the Knicks traded controversial guard Raymond Felton, along with former NBA defensive player of the year, Tyson Chandler, to the Dallas Mavericks. In return, the Knicks received Shane Larkin, José Calderón, Samuel Dalembert, and Wayne Ellington along with two picks for the 2014 NBA draft. The trade was the first one that Jackson ever executed as a front office executive. On June 26, as part of the draft, the Knicks selected Cleanthony Early as the 34th overall pick, and Thanasis Antetokounmpo as the 51st overall pick, using the draft picks received in the trade from the Mavericks. The Knicks also acquired Louis Labeyrie, an additional second-round draft pick, in a trade with the Indiana Pacers for cash considerations. The Knicks would then go onto set a franchise record with its 13th consecutive loss, losing 101–91 to the Washington Wizards, giving New York its longest losing streak in the franchise's 69-season history. This record was extended to 16th consecutive losses, after the NBA Global Games loss against the Milwaukee Bucks in London. The Knicks would finish the 2014–15 season with a win-loss record of 17–65, the worst record in franchise history, and allowed them to gain the 4th overall selection in the upcoming draft. The Knicks also bought out Amar'e Stoudemire's $100 million contract a season early. On June 24, 2015, the Knicks selected Kristaps Porziņģis with the fourth overall pick in the draft, and traded Tim Hardaway Jr. to the Atlanta Hawks in exchange for Jerian Grant, the 19th overall pick. Midway through another losing season, Fisher was relieved of his coaching duties, with Kurt Rambis being named as interim head coach as the Knicks finished the season with a record of 32–50. Jeff Hornacek was then hired as their next head coach, which also oversaw Jackson's most notable acts as an executive. On June 22, former NBA MVP Derrick Rose was traded, along with Justin Holiday and a second-round pick from Chicago, to New York in exchange for Robin Lopez, José Calderón and Grant. The Knicks also signed Joakim Noah, Brandon Jennings, and Courtney Lee to contracts worth a combined $127 million, and regressed the following season, causing the franchise to part ways with Jackson after three years as the Knicks' president of basketball operations. Under Jackson's presidency, the Knicks had gone 80–166, suffered three consecutive losing seasons, and missed three consecutive playoffs. In his last act prior to leaving the Knicks, Jackson selected Frank Ntilikina with the eighth overall pick, Damyean Dotson with the 44th overall pick, and Ognjen Jaramaz with the 58th overall pick in the 2017 NBA draft. Following Jackson's departure, the Knicks appointed Scott Perry as general manager. The Knicks also saw Carmelo Anthony demanding a trade from the team, which posed difficulty for both player and franchise due to a no-trade clause inserted in Anthony's contract given by Jackson in 2013. Originally, the only teams for which he would waive his no trade clause were for the Cleveland Cavaliers and the Houston Rockets, with the former eventually removed from trade discussions due to internal conflicts. Anthony intended to join the Rockets, with a three-way trade with the Portland Trail Blazers set up involving Ryan Anderson. Anderson's three-year, $60 million contract was not feasibly able to be absorbed by either franchise, however, causing Perry to cease talks with the Rockets, before agreeing a deal with the Oklahoma City Thunder, after Anthony agreed to expand his no-trade clause to include the Thunder. The Knicks received Enes Kanter, Doug McDermott and a 2018 second-round pick in exchange for Anthony on September 25, 2017, while also positioning Kristaps Porziņģis as the new centerpiece of the franchise. The Knicks also re-signed Tim Hardaway Jr. to a four-year, $71 million contract, while also agreeing a one-year, minimum contract with Michael Beasley. The franchise also traded for former lottery pick Emmanuel Mudiay from the Denver Nuggets at the trade deadline, who was a point guard the Knicks were rumored to have targeted prior to selecting Porziņģis in 2015. The trade also included the Dallas Mavericks, with Dallas acquiring McDermott from the Knicks, and the Nuggets obtaining Devin Harris from Dallas. However, the season again ended poorly, with 29–53 record to leave the Knicks as the 11th seed in the Eastern Conference. This caused the Knicks to part ways with head coach Jeff Hornacek. Hornacek's two full seasons retained criticism for the team's continued struggle on defense, as well as the inability to implement an efficient, modern offense. The Knicks then replaced him with former Memphis Grizzlies head coach David Fizdale. Fizdale signed a four-year deal, and was tasked to deliver on player development and improving the team's basketball philosophy. On May 15, 2018, the Knicks were awarded the ninth overall pick in the 2018 NBA draft, and selected Kevin Knox from the University of Kentucky. The team also acquired Mitchell Robinson with the 36th overall pick, and signed former lottery pick Mario Hezonja to a one-year, $6.5 million contract. They further invested in untapped potential by signing another former lottery pick, with Noah Vonleh agreeing to a one-year contract. The Knicks unveiled a uniform that would stay for three decades. This uniform, with an arched 'NEW YORK' in serif lettering and in orange, would be the uniform worn during their 1970 and 1973 championship seasons; however they were not introduced simultaneously. The home uniforms would debut in 1968, while the away uniforms debuted the following year. One noticeable feature was that the player's name was in a straight block arched lettering, which was meticulously designed by Gerry Cosby and his sporting goods company. The unusual arrangement on the player's name was later adopted by several Major League Baseball teams in the 1970s, and are currently used by the National Hockey League's Colorado Avalanche, Detroit Red Wings and New York Rangers. On the shorts, there was no logo placed during much of the 1970s, but during the 1978–79 season, the side stripes were eliminated and the interlocking 'NY' logo inside an apple was placed instead. When the uniform was reinstated for the 1983–84 season, it now featured the player's number and the interlocking 'NY' logo, in addition to the return of the side stripes. The shorts number was eliminated in 1987, while variations of the 'Roundball Logo' replaced the 'NY' logo from 1991 to 1997. Since the 1991–92 season various outfitters such as Champion, Puma, Reebok, Adidas and Nike have taken over uniform production from Cosby, while player names reverted to a radial arch and added serifs. On October 25, 2013, the Knicks unveiled an alternate orange uniform, which is essentially a mirror image of the blue away uniforms, but with orange as the primary color and blue and white as trim colors. The uniforms debuted on October 31 in a road game against the Chicago Bulls, and were used in the first five weekend home games, but after going 0–6 in the orange uniforms, they were discontinued permanently. For the 2017–18 season and beyond, Nike will be the NBA's new uniform provider. Under Nike, 'home' and 'away' uniform designations were eliminated, and in their place were the white 'Association' set, primary color 'Icon' set, alternate color 'Statement' set, and annual 'City' set that will be used either at home or away. The Knicks kept their white 'Association' and blue 'Icon' uniforms almost intact with only a few alterations such as truncated shoulder and shorts striping and the modern roundball logo on the waistband. The Knicks' 'Statement' uniform is also white but with additional white trim in the letters and striping and a darker blue hue. The Knicks have also worn special edition uniforms every March as part of the NBA's Noche Latina events and during St. Patrick's Day. The uniforms during Noche Latina were originally white with blue and orange trim, first using the 2001–12 uniform from 2008 to 2012, and then the current uniforms from 2012 to 2015, the only exception being Nueva York in front. In the 2015–16 season, the Knicks used a variation of their away blue uniform for Noche Latina. The Saint Patrick's Day uniforms used the road uniform template except for green substituting for the blue base. These uniforms have also been used on Christmas Day from the 2009–10 season, and was worn in particular by Nate Robinson for a "Kryptonate vs. Superman" theme against Dwight Howard in the 2009 Slam Dunk Contest. The St. Patrick's uniforms were shelved after the 2011–12 season. On Christmas Day 2012, the Knicks wore monochrome uniforms known as 'Big Color'. The uniforms are mostly orange, with blue trimming. The following year, the Knicks wore sleeved orange uniforms known as 'Big Logo', featuring a chrome-treated Knicks logo in front. For the 2014 edition, the Knicks wore a variation of their home uniforms, featuring the team logo in front and the player's first name in a blue nameplate below the number. The 2016 Christmas Day game against the Celtics saw the Knicks wear an all-blue uniform without additional striping, complete with fancy scripted orange lettering and numbers. As part of its deal with Nike, a special "City" uniform would be used to pay tribute to either local culture or team traditions. The Knicks' 2017–18 "City" uniform, which is navy with orange and grey trim and features an emblem containing the team name, uniform number, a ladder with a silhouette of a firefighter, a fire hydrant, and the abbreviation "N.Y.C." for New York City, pays homage to the city's firefighters and their families. It was designed in collaboration with the Knicks, the NBA, Nike and the Uniformed Firefighters Association. The Knicks' 2018–19 "City" uniform is also in navy and features white lettering, a straight aligned "New York" wordmark in front and alternating stripes of blue, navy and orange designed to mimic the New York City skyline. The blue and orange arm striping was inspired from the team's 1950s uniforms. 3 In total, Lucas was inducted into the Hall of Fame twice – as player and as a member of the 1960 Olympic team. The following Knicks players were selected to the NBA All-Star Game. Steve Mills served as general manager and president during the 2013–14 season. At the end of the 2013–14 season Phil Jackson replaced Mills as team's president. He was reinstated as president in 2017, with Scott Perry replacing him as general manager. Italic denotes still active, but not with team. The teams have met nine times in the postseason. The last time was in the 2012–13 season, when Carmelo Anthony won the 2013 scoring title and helped them win the Atlantic Division for the first time since 1994. The Knicks faced the Celtics, who were without Rajon Rondo because of a mid-season injury, in the 1st round of the 2013 playoffs. In both games 1 and 2, Celtics had a lead going into halftime but were held to 25 and 23 points respectively in the second half, which was an all-time low for the franchise in the playoffs. Knicks gained a 3–0 lead in the series, but Boston avoided elimination in games 4 and 5. In game six, Knicks once led by 26 points in the fourth quarter, then the Celtics went onto a 20–0 run in less than 5 minutes to make it a close game, but Knicks still won and moved on to round 2. The rivalry between the New York Knicks and the Indiana Pacers started in 1993 and quickly became one of the most bitter in NBA history. They met in the playoffs 6 times from 1993 to 2000, fueling a rivalry epitomized by the enmity between Reggie Miller and prominent Knick fan Spike Lee. Miller likened it to the Hatfield–McCoy feud, and The New York Times said in 1998 that it was "as combustible as any in the league". The rivalry gave Miller the nickname "The Knick-Killer". His clutch performances were frequently followed by jabs at Lee like the choke sign, adding fuel to the rivalry. The rivalry renewed during the 2013 NBA Playoffs in the Eastern Conference Semifinals, with Indiana taking the series 4 games to 2. The Miami Heat were one of the New York Knicks' strongest inter-divisional foes. The two teams met in the playoffs each year from 1997 to 2000, with all four of those series being played to the maximum number of games. Pat Riley, the head coach of the Miami Heat at the time, served as the head coach of the Knicks from 1991 to 1995 and led the Knicks to the 1994 NBA Finals. During this four-year span, the Heat and the Knicks each won two playoff series against each other. ^ "NBA.com/Stats–New York Knicks seasons". National Basketball Association. Retrieved January 29, 2017. ^ a b c "What's a Knickerbocker?". NYKnicks.com. NBA Media Ventures, LLC. Retrieved May 9, 2018. ^ "Knicks Jersey Vault". NYKnicks.com. NBA Media Ventures, LLC. Archived from the original on September 1, 2012. Retrieved May 9, 2018. ^ "New York Knicks Reproduction and Usage Guideline Sheet". NBA Properties, Inc. Retrieved August 10, 2016. ^ "Squarespace X Knicks Announce Signature Partnership". NYKnicks.com (Press release). NBA Media Ventures, LLC. October 10, 2017. Retrieved December 17, 2017. ^ "What Is A Knickerbocker?" (PDF). 2017–18 New York Knicks Media Guide. NBA Media Ventures, LLC. October 9, 2017. Retrieved October 11, 2018. ^ "Basketball Association of America League Minutes". APBR.org. Archived from the original on February 27, 2011. Retrieved February 27, 2011. ^ Vecsey, George (August 10, 2009). "Pioneering Knick Returns to Garden". The New York Times. Archived from the original on April 16, 2011. Retrieved April 16, 2011. ^ a b c d e f g h i j k l m n o p q r s t u v w "New York Knicks History". New York Knicks. Archived from the original on December 4, 2008. Retrieved April 16, 2011. ^ Briordy, William J. (January 28, 1956). "Lapchick Quits as Knick Coach But He Plans to Finish Season; Cites 'Poor Health and Too Many, Sleepless Nights' as Bases for Decision Lot of Possibilities Team in Third Place". The New York Times. Retrieved June 23, 2011. ^ Briordy, William J. (February 12, 1956). "Knicks Vanquish Hawks, 107 TO 91, For Coach Boryla; McGuire Scores 20 Points as New Mentor Takes Reins in $12,000 Post McGuire Gets Eight Assists Boryla Signs Contract Khicks Vanquish Hawks, 107 TO 91". The New York Times. Retrieved June 23, 2011. ^ "Boryla Resigns as Coach of the Knicks; Team In Cellar For Two Season Levane Likely Successor to Boryla, Who Will Stay as Knicks' Head Scout". The New York Times. April 5, 1958. Retrieved June 23, 2011. ^ a b c d e f g h i j k l m n "New York Knickerbockers Franchise Index". Basketball Reference. Retrieved June 23, 2011. ^ Conklin, William R. (December 19, 1959). "Braun Becomes Knickerbocker Coach After Levane Resigns Under Pressure; Club's 8–19 Mark Prompts Change". The New York Times. ^ Sheehan, Joseph M. (May 9, 1961). "Donovan Replaces Braun as Coach of Knicks; Jerseyan, 38, Now at St. Bonaventure, Signs for 2 Years Guided College Five to a No. 3 Ranking – Boryla Retained". The New York Times. Retrieved June 23, 2011. ^ Koppett, Leonard (January 4, 1965). "Knicks Name Gallatin as Coach and Promote Donovan to General Manager; Ex-New York Ace Takes Over Today Gallatin, Hawk Coach 21/2 Years, Signs – Donovan Given More Authority". The New York Times. Retrieved June 23, 2011. ^ Cady, Steve (December 21, 1968). "Knicks Top Pistons, 135–87; DeBusschere Stars; Ex-Detroit Coach Scores 21 Points He Sets Up New Teammates for Many Baskets, Too, in First Game Since Trade". The New York Times. Retrieved June 23, 2011. ^ "1968–69 New York Knickerbockers Schedule and Results". Basketball Reference. Retrieved June 23, 2011. ^ a b "1969–70 New York Knickerbockers Roster and Statistics". Basketball Reference. Retrieved June 23, 2011. ^ "All-Time Winning Streaks". National Basketball Association. March 19, 2008. Archived from the original on June 23, 2011. Retrieved June 23, 2011. ^ a b c d e f g "Gutsy Reed Rallies Knicks in Game 7". National Basketball Association. Archived from the original on June 26, 2011. Retrieved June 26, 2011. ^ "Knicks Win One for the 'Aged'". National Basketball Association. Archived from the original on June 26, 2011. Retrieved June 26, 2011. ^ "1973–74 New York Knickerbockers Roster and Statistics". Basketball Reference. Retrieved June 26, 2011. ^ Goldaper, Sam (September 19, 1974). "Reed Retires as Player for the Knicks; No Decision Made on Post With Club; Career Record of Willis Reed. Reed Quit As Player For Knicks". The New York Times. Retrieved June 26, 2011. ^ Goldaper, Sam (March 9, 1977). "Knicks Will Name Reed Coach Today With a 3-Year Contract; Reed Will Get 3-Year Pact; Nuggets Top Knicks, 114–108". The New York Times. Retrieved June 26, 2011. ^ "1977–78 New York Knickerbockers Roster and Statistics". Basketball Reference. Retrieved June 26, 2011. ^ a b "1978–79 New York Knickerbockers Roster and Statistics". Basketball Reference. Retrieved June 26, 2011. ^ Eskenazi, Gerald (November 12, 1978). "Anatomy of a Dismissal: It Was Inevitable; Reed Sounded Off McMillian's Complaint A Solid Vote for Burke". The New York Times. Retrieved June 26, 2011. ^ Goldaper, Sam (November 13, 1978). "Holzman the Taskmaster Is Back and Knicks Know It; A Defensive Lapse The Old Knicks Shock and Surprise McAdoo's Assessment Auerbach Backs Dismissal". The New York Times. Retrieved June 26, 2011. ^ Beck, Howard (February 10, 2011). "Farewell Tour Brings Jackson to the Garden". The New York Times. Retrieved June 26, 2011. ^ "1982–83 New York Knickerbockers Roster and Statistics". Basketball Reference. Retrieved June 26, 2011. ^ "Daily News America – Breaking national news, video, and photos – Homepage". New York Daily News. Retrieved July 1, 2013. ^ "Ewing traded to Sonics in four-team deal". Enquirer.com. September 21, 2000. Retrieved July 1, 2013. ^ "2000–01 New York Knicks Roster and Statistics". Basketball Reference. Retrieved July 4, 2011. ^ "Knicks knocked out". Sports Illustrated. Associated Press. May 4, 2001. Archived from the original on July 4, 2011. Retrieved July 4, 2011. ^ "Van Gundy quits; Chaney reportedly will finish season". ESPN. Associated Press. December 8, 2001. Archived from the original on July 4, 2011. Retrieved July 4, 2011. ^ "Knicks Extend Chaney's Contract". Los Angeles Times. October 30, 2002. Archived from the original on July 4, 2011. Retrieved July 4, 2011. ^ a b Broussard, Chris (April 18, 2003). "Pro Basketball; Grim News for Knicks: More Surgery for McDyess". The New York Times. Archived from the original on July 4, 2011. Retrieved July 4, 2011. ^ Beck, Howard (June 27, 2003). "James Isn't Knicks' Be-All and End-All". The New York Times. Archived from the original on July 4, 2011. Retrieved July 4, 2011. ^ "2002–03 New York Knicks Schedule and Results". Basketball Reference. Retrieved July 4, 2011. ^ "Walsh Named Knicks President, Basketball Operations". New York Knicks. April 2, 2008. Archived from the original on April 15, 2011. Retrieved May 17, 2008. ^ "Walsh Plans To Get Knicks Under Salary Cap, Change Media Policy". Sports Business Daily. April 3, 2008. Archived from the original on July 5, 2011. Retrieved July 5, 2011. ^ Dougherty, Mike (April 19, 2008). "After tumultuous run, Knicks fire Isiah Thomas". USA Today. Archived from the original on April 15, 2011. Retrieved April 15, 2011. ^ a b "Knicks introduce new coach D'Antoni". ESPN. Associated Press. May 13, 2008. Archived from the original on April 15, 2011. Retrieved May 17, 2008. ^ Parker, Patrick (June 26, 2008). "Knicks fans give Gallinari his own jeering section on draft night". ESPN. Archived from the original on April 15, 2011. Retrieved April 15, 2011. ^ a b Lawrence, Mitch (December 10, 2011). "Done deal: Knicks complete Tyson trade". New York Daily News. Archived from the original on February 21, 2012. Retrieved December 10, 2011. ^ Zwerling, Jared (December 11, 2011). "Knicks make flurry of moves". ESPN New York. Archived from the original on February 21, 2012. Retrieved February 21, 2012. ^ Begley, Ian (December 20, 2011). "Knicks officially sign Baron Davis". ESPN New York. Archived from the original on February 21, 2012. Retrieved February 21, 2012. ^ Lawrence, Mitch (December 30, 2011). "Knicks already at a turning point". New York Daily News. Archived from the original on February 21, 2012. Retrieved February 21, 2012. ^ Lawrence, Mitch (January 12, 2012). "Knicks winning but missing the point". New York Daily News. Archived from the original on February 2012. Retrieved February 21, 2012. ^ a b c d Begley, Ian (February 5, 2012). "Lin points Knicks in right direction". ESPN New York. Archived from the original on February 21, 2012. Retrieved February 21, 2012. ^ Clark, Kevin (January 25, 2012). "Is Carmelo Trying to Do Too Much?". The Wall Street Journal. Archived from the original on February 21, 2012. Retrieved February 21, 2012. ^ Stein, Marc (December 27, 2011). "Knicks claim guard Jeremy Lin". ESPN New York. Archived from the original on February 21, 2012. Retrieved February 21, 2012. ^ Begley, Ian (February 6, 2012). "Jeremy Lin starting at PG". ESPN New York. Archived from the original on February 21, 2012. Retrieved February 21, 2012. ^ "Lin has 13 assists, Knicks run win streak to 7". Sports Illustrated. Associated Press. February 15, 2012. Archived from the original on February 21, 2012. Retrieved February 21, 2012. ^ Begley, Ian (February 14, 2012). "Amare Stoudemire returns to N.Y." ESPN. Archived from the original on February 21, 2012. Retrieved February 21, 2012. ^ Begley, Ian (February 20, 2012). "Carmelo Anthony returns Monday". ESPN New York. Archived from the original on February 21, 2012. Retrieved February 21, 2012. ^ Albom, Mitch (February 19, 2012). "Linsanity is better to love than to hate". The Province. Archived from the original on February 21, 2012. Retrieved February 21, 2012. ^ "Knicks coach Mike D'Antoni resigns". ESPN New York. Associated Press. March 14, 2012. Archived from the original on March 14, 2012. Retrieved March 14, 2012. ^ "Bobcats fall to Knicks, finish with worst winning percentage in NBA history". ESPN New York. Associated Press. April 26, 2012. Archived from the original on April 27, 2012. Retrieved April 27, 2012. ^ Berman, Marc (May 6, 2012). "Knicks face elimination by Heat in Game 4 today". New York Post. Archived from the original on May 22, 2012. Retrieved May 22, 2012. ^ a b "LeBron James, Heat close out Knicks in five games". ESPN. Associated Press. May 9, 2012. Archived from the original on May 22, 2012. Retrieved May 22, 2012. ^ Begley, Ian (May 26, 2012). "Knicks extend coach Mike Woodson". ESPN New York. Archived from the original on May 28, 2012. Retrieved May 28, 2012. ^ Stein, Marc (July 5, 2012). "Jason Kidd opts to join Knicks". ESPN New York. Archived from the original on July 6, 2012. Retrieved July 6, 2012. ^ Taylor, Nate (July 9, 2012). "Knicks Acquire Camby and Re-Sign Novak". The New York Times. Retrieved July 11, 2012. ^ Begley, Ian (July 10, 2012). "Knicks to re-sign J.R. Smith". ESPN New York. Archived from the original on July 11, 2012. Retrieved July 11, 2012. ^ "Knicks vs. Wizards: New York beats Washington for 10th straight time – NBA – Sporting News". Aol.sportingnews.com. Associated Press. August 15, 2009. Retrieved July 1, 2013. ^ a b c "Steve Mills rejoins Knicks as GM". ESPN New York. September 26, 2013. Retrieved September 26, 2013. ^ a b "Jackson returns to Knicks as team president". National Basketball Association. Associated Press. March 18, 2014. Retrieved August 8, 2015. ^ "Knicks Hire Derek Fisher As Head Coach". New York Knicks. June 10, 2014. Retrieved August 8, 2015. ^ "Knicks Relieve Fisher Of Coaching Duties". New York Knicks. February 8, 2016. Retrieved February 8, 2016. ^ a b "Phil Jackson, New York Knicks Agree to Part Company". NBA.com. June 28, 2017. Retrieved June 28, 2017. ^ "Knicks, Phil mutually part ways after 3 years". ESPN.com. Retrieved June 28, 2017. ^ a b "Steve Mills named president, Scott Perry named general manager of New York Knicks". NBA.com. Retrieved July 14, 2017. ^ "Carmelo Anthony traded to Thunder in blockbuster deal". SBNation. September 23, 2017. Retrieved September 24, 2017. ^ "Carmelo Anthony adds Cavaliers, Thunder to list of teams he's willing to get traded to". USA Today. September 21, 2017. Retrieved September 22, 2017. ^ "Knicks Trade Carmelo Anthony To Oklahoma City". NBA.com. September 25, 2017. Retrieved October 19, 2017. ^ Berman, Marc (September 24, 2017). "The Knicks belong to Kristaps Porzingis: Now what?". New York Post. Retrieved October 20, 2017. ^ "Why Emmanuel Mudiay would be the right draft pick for the Knicks at No. 4". FOX Sports. May 28, 2015. Retrieved February 8, 2018. ^ "Knicks acquire Emmanual Mudiay in 3-team trade". NBA.com. February 8, 2018. Retrieved February 8, 2018. ^ "JEFF HORNACEK RELIEVED OF HEAD COACHING DUTIES". NBA.com. April 12, 2018. Retrieved April 14, 2018. ^ "New York Knicks Fire Jeff Hornacek, Beginning Another Search For Stability And A Modern Offense". Forbes. April 12, 2018. Retrieved April 14, 2018. ^ "Why Knicks job intrigued David Fizdale so much". New York Post. Retrieved May 28, 2018. ^ "David Fizdale appears to be the right man to lead the Knicks". NewsDay. Retrieved May 28, 2018. ^ Iseman, Chris (May 16, 2018). "NBA lottery: New York Knicks to pick 9th in NBA draft". North Jersey. Retrieved May 29, 2018. ^ "Knicks Sign Noah Vonleh, Continue To Invest In Untapped Potential". Forbes. Retrieved July 27, 2018. ^ a b c "What's a Knickerbocker?". New York Knicks. Retrieved December 17, 2012. ^ Beck, Howard (September 6, 2012). "Knicks Play Up Their 'New' Uniforms". New York Times. Retrieved August 6, 2015. ^ Moore, Matt (October 25, 2013). "Knicks unveil orange jerseys". CBS Sports. Retrieved August 31, 2015. ^ "Uniform Details: New-Look Knicks Nike Jerseys". New York Knicks. Retrieved September 24, 2017. ^ "Knicks Unveil Statement Jerseys". New York Knicks. Retrieved November 28, 2017. ^ "Knicks Unveil City Edition Uniforms Paying Homage to Firefighters & Their Families". New York Knicks. Retrieved January 11, 2018. ^ "New York Knicks Unveil City Edition Uniforms Inspired by the NYC Skyline". New York Knicks. Retrieved November 24, 2018. ^ Vorkunov, Mike (June 22, 2017). "Knicks Draft Frank Ntilikina of France, Avoiding a Dramatic Twist". NYTimes.com. Retrieved April 21, 2018. ^ "2014 NBA Draft Results: Knicks acquire Louis Labeyrie with 57th pick". SBNation.com. June 27, 2014. Retrieved October 2, 2014. ^ "Knicks Acquire Tyson Chandler". NBA.com. December 10, 2011. Retrieved April 21, 2014. ^ "New York Knicks All-Star Game Selections". Basketball-reference.com. Retrieved February 17, 2018. ^ Bushnell, Henry (July 14, 2017). "Knicks hire Scott Perry as new GM, but how much control will he have?". Yahoo Sports!. Retrieved May 31, 2018. ^ Isola, Frank (April 24, 2012). "Glen Grunwald named Knicks executive VP and general manager". New York Daily News. Archived from the original on July 6, 2012. Retrieved July 6, 2012. ^ Eskenazi, Gerald (May 23, 1974). "Ned Irish Retiring July 1 After 40 Years at Garden". The New York Times. Retrieved August 5, 2018. ^ a b "New York Knicks: Players". Basketball Reference. April 18, 2017. Retrieved April 11, 2019.